I've been invited to do a trunk show by the program director of our Guild. At first I thought why me? Next I felt honoured to be asked; now I can't stop thinking about how and what I should present. I suppose a good place to start is with your first quilt, but I no longer have that one. I posted about it here. Doing a virtual trunk show might not be a bad idea either. So I've decided to post about quilts out of my trunk each Tuesday. Ya....that's it Trunk Show Tuesday! Besides it will motivate me to post more frequently too. So here is my first trunk show post. This quilt was made for my niece for Christmas 1992. Unfortunately it did not get finished in time. 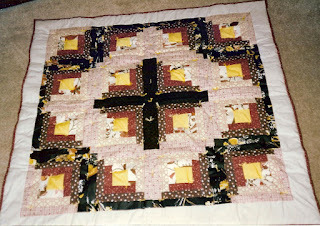 I started it in August 1992 and got caught up in another quilt for our company United Way fund drive. 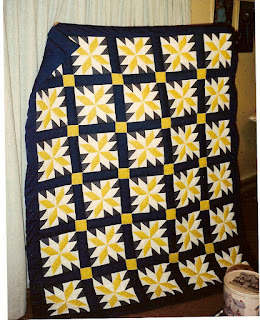 She received the quilt for her birthday, April 1993. It was my first attempt at hand quilting. My previous quilt had been tied. If I recall, the block’s name is Milky Way but I can’t be certain. The colours chosen were to match the decor of my niece's bedroom. 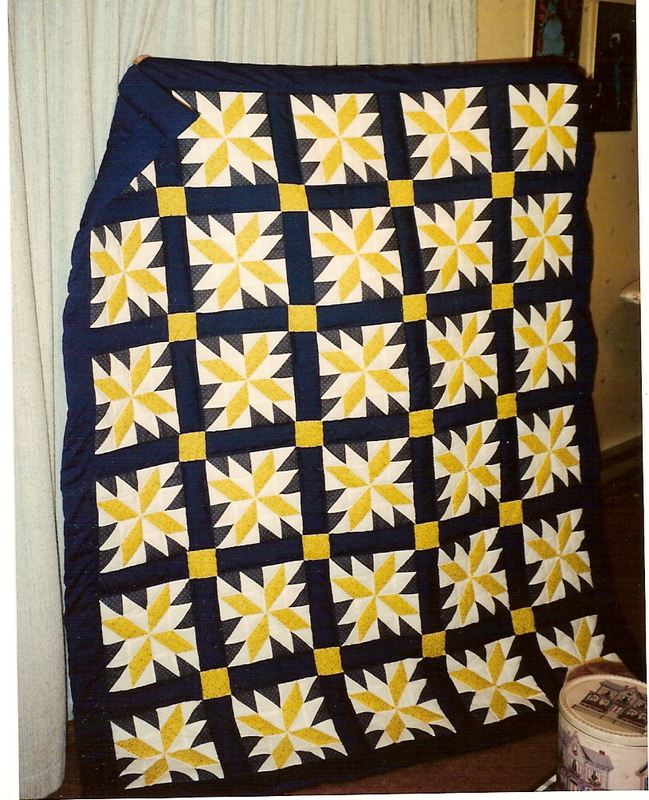 This quilt, made for a corporate United Way fund drive as a door prize, measured 4 feet by 4 feet. The winner was Kathy Chelew. The fabric used was from scraps found in my family’s sewing basket. The central brown cross was a purchased fabric from my first visit to Wineberry’s, a fabric store located in Surrey, British Columbia. I had yet to learn the intricacies of colour selection, but I have learned this comes with practice and time. It was tied with yellow embroidery cotton. Good idea! Great show - looking forward to the rest! Congrats on doing a show for your guild - a great honor! What an honour! and what fun! These two are a great start. I will be looking forward to your posts.